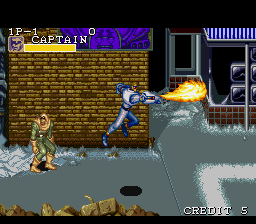 OverviewTake control of one of four heroes, led by the titular superhero Captain Commando, and take on super-powered criminals in this futuristic 2D brawler by Capcom. 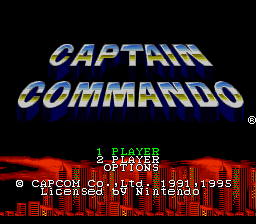 Captain Commando is a 1991 beat'em up game for the Super Nintendo Entertainment system. It stars a team of Heroes led by Captain Commando. 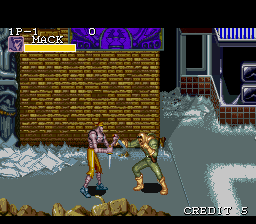 Their are four playable characters, Captain Commando, Mack the Knife, Baby Head, and Genzu the Ninja. Each feels unique in their own play style. The game itself is played much like Final Fight, progress through the stage, beat up some goons, then fight a boss. rinse and repeat with progressing difficulty. Overall it is a long game being 10 stages overall. The game itself is very colorful and has a lot going on in it even with the limitations of the SNES. Now you can add videos, screenshots, or other images (cover scans, disc scans, etc.) for Captain Commando (Europe) to Emuparadise. Do it now! If you haven't noticed yet, we have a retro game of the day feature (top-right of the screen) wherein we feature a new retro title every single day! Now, you can vote for your favorite games and allow them to have their moment of glory. Click on the button below to nominate Captain Commando (Europe) for Retro Game of the Day.